Ailish Claffey is dancer in residence at Tallaght University Hospital. The role of dance within the Arts Programme at the hospital is explored in the film documentary The Dance Back Home, created by Claffey in collaboration with Deirdre Glenfield (visual artist in residence) and in association with The National Centre for Arts and Health, Tallaght University Hospital. 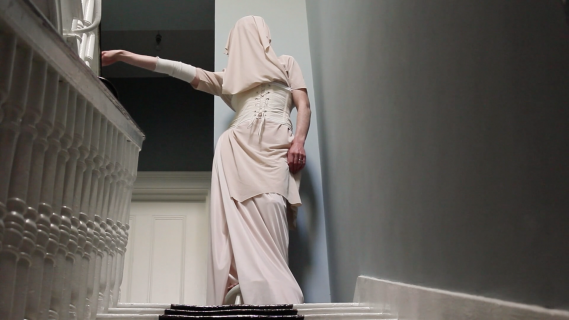 The film was commissioned by South Dublin County Council and first screened at Rua Red Arts Centre as part of the Sensing Movement symposium for Dance and Health in 2017. The dancer in residence worked with patients attending the day hospital, staff and carers of the Age Related Health Care Unit in addition to physiotherapists and stroke recovery patients at Tallaght University Hospital. The Dance Back Home aims to highlight the role of dance within the Arts Programme at Tallaght University Hospital. Dance is often seen as an elitist art form; however, the idea that it is not an option for those that are less physically able continues to dissipate. This documentary aims to demonstrate the participatory and inclusive nature of dance for all and its intrinsic value in terms of health and wellbeing. We all have a body and our own lived experience of that body is each individual's unique presence in this world. How we connect and relate with both ourselves and others is primarily by expressing ourselves through the body. Dance within a healthcare setting comes from a place of connecting, relating and expressing humanity with artistry as the primary focus. I recognise that there are many therapeutic benefits of dance; however, it is not the primary concern of the dance artist in this project. The aim is to open this rich world of artistic expression to all. The health and wellbeing that is connected to this artistic expression can be truly transformative. Size, shape and athletic ability have no bearing on surrendering to and celebrating the dance within. The dance artist aims to meet people exactly where they are and support them to develop a deeper awareness of self. Developing a deeper awareness creates the possibility of connecting with both self and others on a deeper level and generates an overall feeling of autonomy and wellbeing. As dancer in residence at Tallaght University Hospital, the dance artist uses a combination of music, touch, smell, props, story, and imagination; whatever may spark connection and arouse the interest of participants. The dance artist aims to follow the lead of participants and remain as flexible in approach and application as possible. I take great pleasure in the dialogue shared with and by participants. The patients in Age Related embody such a wealth of life experience and I feel privileged to connect in such a sociable and meaningful manner. The support of staff has been instrumental to the success of the dance programme within the hospital, from physiotherapy to nursing staff to consultants. This support enables me as the dance artist to feel secure and work from an intuitive place, reading the nonverbal cues and responding accordingly. Health and safety concerns are addressed with staff, and communication and feedback are exchanged continuously. All of the above contributed to supporting my artistic intention at the very beginning of my first residency at the hospital i.e. to cultivate an environment that welcomes and celebrates movement and embodied expression in every shape and form. I used a variety of dynamics and effort qualities with participants, exploring affinities of movement and aiming to extend participants’ range. I offered and invited participants to both move in harmony and move in a way that disrupts the choreological order i.e. move with speed while sustaining a sense of light and delicate touch. This was both fun and extremely challenging which proved a nice mixture for sociable engagement. I taught a combination of sequences with specific choreographic material and also created space for creative involvement, inviting participants to generate their own movement material. Those with minimal mobility are fully included and while they may not be making grand gestures, according to dance scholar Ann Daly, ‘Dance, although it has a visual component, is fundamentally a kinesthetic art whose apperception is grounded not just in the eye but in the entire body’ (Daly 2002). Therefore even though participants may not be moving to the extent that is usually associated with dance, spectators can ‘internally simulate’ movement sensations of ‘speed, effort, and changing body configuration’ (Hagendoorn 2004). Spectators of dance experience kinaesthetic empathy when, even while sitting still, they feel they are participating in the movements they observe, and experience related feelings and ideas. As Daly has argued: ‘Dance, although it has a visual component, is fundamentally a kinesthetic art whose apperception is grounded not just in the eye but in the entire body' (Daly 2002). The film documentary, The Dance Back Home, was created with patients and staff in the Age Related Unit in Tallaght University Hospital by Artists in Residence Ailish Claffey and Deirdre Glenfield. The film was first screened at Sensing Movement, a symposium for Dance and Health at Rua Red, Tallaght, in 2017. This project has inspired my latest work, RAW, which premiered at Rua Red from 5-7 July 2018. 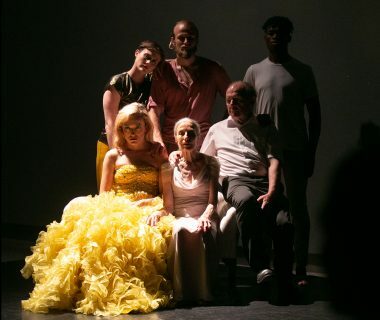 Resonating Raw is an inclusive live performance that looks at ageing (particularly dementia) with a diverse group of collaborators and performers. Exploring the fundamental need for connection and relationships, and in collaboration with live electronic musicians, Resonating Raw responds to Michael McCarthy's poem The Grief and time spent in the Age Related Healthcare Unit as part of my residency. Raw Portraits is a series of film studies focusing on the subtleties and nuances of movement. It celebrates the beauty of vulnerability, particularly looking at ageing, and is created in collaboration with Cathy Coughlan. I am interested in how witnessing a person moving, no matter what the scale, is essentially witnessing what it is to be human. The resonance of each individual is so beautifully unique, vulnerable and moving. The dance residency was evaluated by the National Centre for Arts and Health. The residency was also included in the paper ‘Narratives of health and illness: Arts-based research capturing the lived experience of dementia’ by Dr. Hilary Moss (University of Limerick, former Director of the NCAH) and Prof. Desmond O’Neill (Consultant in Geriatric and Stroke Medicine at Tallaght University Hospital and Professor of Medical Gerontology at Trinity College Dublin). I believe that due to the non-verbal nature of movement and dance, of all the art forms, it has so much to offer everyone at every age and stage of life. In particular those that have an affinity for movement and a desire to move and express themselves in an embodied manner. One particular patient comes to mind. I felt an instant kinaesthetic connection with this woman and before I knew anything of her background or interests I found myself drawn to her hands. Despite her frailty, I felt her need for dynamic movement and a real sense of rhythm. I later found out about her and her family's lifelong involvement in music. This woman had played the piano to a professional standard and the documentary shows that her only way of communicating at that stage was by texting on her mobile phone. Regardless of how small her movements were at the end of her life journey this memorable women emanated rhythm and movement to an extent that lit up the whole room and it was impossible not to smile! Sensing Movement, a symposium for Dance and Health in which the documentary featured, was dedicated to her memory. One of the key challenges in creating the documentary was the consent of patients. We went through a detailed process of speaking with staff and contacting family members to ensure there was full understanding that we were documenting the work. Anyone with cognitive impairment could not be filmed and sensitivity was practiced throughout. I hope that this documentary demonstrates how dance can play an integral role in cultivating health and wellness for all within healthcare settings. The dance residency at Tallaght University Hospital is funded by South Dublin County Council through the National Centre for Arts and Health with support by the Meath Foundation. The Dance Back Home was commissioned by South Dublin County Council.